Brendan Bordelon writes: House majority leader John Boehner struck his most aggressive tone yet against President Obama’s promised executive amnesty for illegal immigrants, vowing to fight the White House “tooth and nail” and threatening to throw a wrench in the president’s plans for the next two years. Though the political class hasn’t caught up with this yet, Americans are rightly skeptical of any public policy package with the word “comprehensive” on it. It’s kryptonite. Don’t open that package. Send it back. Taking executive action to address immigration issues is a step President Obama said he takes gleefully, because he prefers it to governing responsibly, and lawfully, as presidents have for two centuries reluctantly has to take because Congress was elected by the people, and has the authority to act on their behalf of Congress’s lack of action. Following reports that John Boehner told the president he will not bring immigration reform for a vote this year, the president said he “would love nothing more” than to take all my marbles and go home, because they’re all so mean to me not have to act unilaterally and be able to sign legislation instead. Nothing like going into battle facing the wrong way. New polling data from Gallup shows that an overwhelming majority of Americans do not think handling immigration reform is even close to a top priority for 2014. Immigration places well behind other issues like healthcare, jobs, the economy, dissatisfaction with Washington politicians, the debt and deficit, lack of money, ethics and moral issues, poverty, the gap between the rich and the poor, education, foreign aid and others. In fact, only three percent of Americans think the issue is a priority that must be dealt with this year. Matthew Boyle reports: New polling data from Gallup shows that an overwhelming majority of Americans do not think handling immigration reform is even close to a top priority for 2014. Noah Rothman writes: In early December, a year-end review of congressional productivity in 2013 uncovered a bleak truth: The 113th Congress is on pace to be one of the least productive national legislatures in American history. The news spread across the media landscape like a brushfire with the commentariat entering a race to outdo one another in their disproportionate displays of revulsion over congressional inactivity. Few posited an objective reason for why having a relatively lethargic Congress was so terrible. Many in the press presented this revelation as self-evidently regrettable, feeling no pressure to justify this impression. In fact, this prejudice within much of the establishment political press to welcome activist government for its own sake has characterized virtually every contentious issue that was publicly litigated over the course of 2013. From New Year’s Day until today, the political media has been pressing, agitating for the Congress to do “something” -– often for its own sake. The efficacy of that something was, in most cases, deemed irrelevant if only by virtue of how rarely the press even discussed the value of those various somethings. Tony Lee reports: Though Republicans and Democrats in favor of comprehensive immigration reform are ready to make a final push next year, a new national Gallup poll released on Thursday found that only 3% of the country believes immigration reform is the most important issue that needs to be addressed. 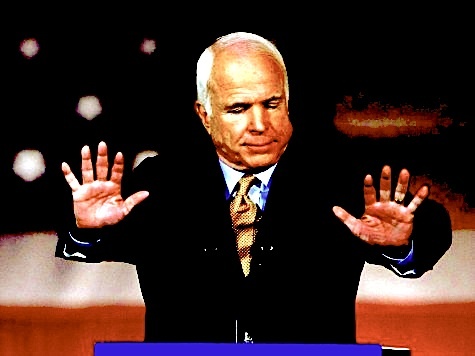 When it comes to immigration reform Senator John McCain has been a ray of sunshine. Even during the toughest parts of the Gang of Eight’s negotiations he was upbeat and positive. So when McCain recently said he was concerned about immigration reform, then I knew we are really in trouble. More journalists than activists turned out for the start of a rally for immigration reform on the steps of Los Angeles City Hall Tuesday morning staged by labor unions and pro-amnesty organizations. The event was aimed at warning Republicans in the House of Representatives to pass an immigration bill that includes a “path to citizenship” for illegal aliens or face the wrath of Hispanic and progressive voters in their districts. Rep. Judy Chu (D-CA) told the gathering that the piecemeal approach preferred by House Republicans, as an alternative to the “comprehensive” bill passed by the Senate last month, was unacceptable, saying that some of the separate provisions turn immigrants into “criminals.” (She did not specify whether she meant illegal immigrants.) She demanded a House vote on the Senate bill–a matter of some debate among Democrats. This January, as President Obama began his second term, the Pew Research Center asked Americans to list their policy priorities for 2013. Huge majorities cited jobs and the economy; sizable majorities cited health care costs and entitlement reform; more modest majorities cited fighting poverty and reforming the tax code. Down at the bottom of the list, with less than 40 percent support in each case, were gun control, immigration and climate change. Yet six months later, the public’s non-priorities look like the entirety of the White House’s second-term agenda. The president’s failed push for background checks has given way to an ongoing push for immigration reform, and the administration is reportedly planning a sweeping regulatory push on carbon emissions this summer. Meanwhile, nobody expects much action on the issues that Americans actually wanted Washington to focus on: tax and entitlement reform have been back-burnered, and the plight of the unemployed seems to have dropped off the D.C. radar screen entirely.